Home dialysis is an option for many people with kidney failure. It can allow for more independence and increased quality of life. 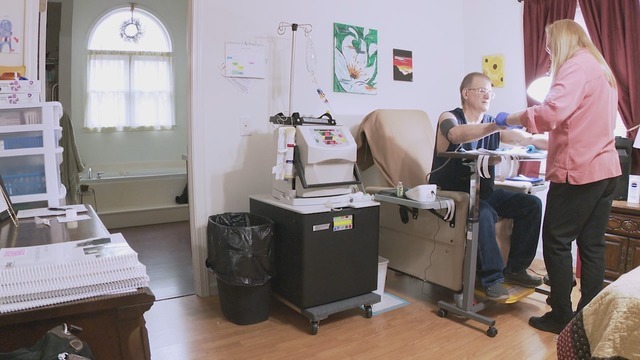 The link below is the story of a man who is doing home hemodialysis in Georgia. The video link within the article is quite informative. He is doing his home hemodialysis with the NxStage machine, the same technology available to the patients of Meadow Kidney Care. Home hemodialysis and peritoneal dialysis are provided at Fresenius Medical Care units in Hagerstown, Chambersburg, and Martinsburg. If you are interested in learning more about home therapies, and are a current in-center dialysis patient, speak with your nurse or physician to learn more. Programs are available to allow patients to experience the difference that home hemodialysis can provide.